390cm/350cm (about 13ft/11.5ft). The HYDRA rod can be fully extended for the full 13ft length or you can collapse and lock the first section to make the rod an 11.5ft length rod. This give you more a rod that can fit a broader range of fishing situations. The 13ft length is excellent for when you have open area to cast, or larger water with needed reach, or when you need longer leverage length to fight bigger fish. In the longer length the HYDRA rod can handle trout around 20in quite well with proper technique, and we did just that with it quite a bit this past summer and fall. The 11.5ft length is a good general purpose length for Tenkara allowing you to cast nicely in small streams. If you are targeting small fish (such as 4-8″ trout) the shorter length will be the most responsive and fun length. The short length will be softer action than the longer length, which fits better for very small fish and smaller streams. The 6:4 Action of the HYDRA rod is much softer than our other rods (such as the Shadowfire & KOMODO rod). It also has a deeper flex profile that gives it an upgraded casting feel and distributes the bend of the rod better. If you have fished our Shadowfire or KOMODO rods you will find this rod to be quite an upgrade. The soft action of the HYDRA rod also makes it an excellent choice for fishing light level line. It will also perform great with our furled lines as well (such as the Bushi, Shogun, or Katana furled lines). 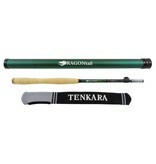 The HYDRA rod is a great rod that even seasoned Tenkara anglers will enjoy quite a bit. You will love the soft cast and delicate action that surpasses rods in the same price range as the HYDRA zx390. It is one of my favorite rods to fish and my go to when fishing light level line. The HYDRA Tenkara rod is a great choice for beginners giving them a one quality rod to fit many situations with out the need of investing in 2 rods. It also gives them a rod they will love after they have been in the Tenkara game for quite some time. Our HYDRA rod handle fits the hand more comfortably to reduce hand fatigue and to give you more casting control that you will be pleased with. It is also shaped so you have multiple options of holding the handle in both the lower and upper areas of the handle to fit your preference or situational needs. The matte black color keeps the rod from reflecting the sun off a 13ft rod and possibly alerting the fish of your presence. Despite being matte black, this rod is very appealing to the eyes and has a quality finish.